This has to go down in the record books as the most delayed blog post I have ever done. It was actually in July last year that we visited the Isles of Scilly, so that gives you an idea of just how behind I am! We were blessed with some incredible weather during our week-long stay on St Mary’s. The journey there though, for me, wasn’t quite so pleasant. I had heard that the crossing on the Scillonian wasn’t always the most enjoyable of boat trips, but having never experienced seasickness before I thought I might just be ok. I was wrong! The only consolation was that we got some distance views of Longships, Tater Du and Wolf Rock lighthouses from the boat. It was worth it though. The incredible island-hopping lifestyle in the Scillies is incredible. I think we all fell a little in love with the ease at which you could hop across from one to another of the islands, all of which possess their own unique character. After arriving at our accommodation, the lovely two-bedroom Baker’s Flat above an amazing bakery, we headed out for our first lighthouse visit of the trip. Penninis lighthouse, built in 1911, sits at the most southerly point of St Mary’s. The lighthouse was established to replace the old lighthouse on the neighbouring island of St Agnes. It’s a wonderful walk to get there and the lighthouse sits among some incredible coastal scenery. On day two we visited Tresco, which itself doesn’t boast a lighthouse, although there were some great views across to Round Island and its lighthouse on the day we were there. While on Tresco we visited the gardens (very expensive admission) and took a walk to the north end of the island. For me Tresco was the island I found least connection with during our visit – and not just because of the prices! We paid a couple of trips to St Martins during the week, the first visiting the red and white striped daymark at the island’s highest point and the tidal White Island. Again, no lighthouses, but we really enjoyed seeing the wild side of the island and then the more lively side a few days later. During our second visit we very much enjoyed a stop off at the vineyard. The vineyard is a wonderful place and it was great to hear all about how the family-run business started and grew. During our trip to St Agnes we wandered across to another tidal island, Gugh, while the tide was low. It’s a fabulous little island and I can certainly see the appeal of living in the only property on the island! There were also some wonderful views across to the lighthouse on St Agnes as well as Bishop Rock lighthouse. The lighthouse on St Agnes is beautiful, although we weren’t able to get too close as it is privately owned. What a home that must make for someone. The lighthouse was built in 1680, but you certainly wouldn’t think it to look at it now. These buildings were made to last! I mentioned Bishop Rock in the last paragraph and, fortunately, we had a very kind boatmen ferrying us around the smaller islands of the Scillies who had agreed to take us out there. It wasn’t the smoothest of rides, although the sea was pretty calm that day. We couldn’t have asked for a better day though with blue skies and bright sunshine, which always make a perfect backdrop for those stunning rock lighthouses. There is something breathtaking about the majesty of these amazing buildings that, against the odds, sit in the middle of the sea with no protection. Bishop Rock is no exception. The structure (the second attempt) dates back to 1858 although reinforcement was added later that century to strengthen it. On the way to the lighthouse we had seen what remains of the old lighthouse builders’ operational base on the nearby island of Rosevear. The kind boatman excelled himself again by agreeing to give us a closer view of Round Island and it’s lighthouse – or as close as we could get without landing anyway. We had seen it from a number of different angles on previous days, but it was much better to see it close up. At the time I was sitting in a small boat off the back of the main boat with the wife of another “island-bagger” as we’d got out of the boat on a different island and our legs weren’t quite long enough for us to get back in. It was quite a bumpy ride we had at times! So nice to sit in the sun though and gaze at the lighthouse. Round Island lighthouse was built in 1887 and there is an incredible staircase carved out of the stones leading up to it. It’s marvellous what they managed to achieve using the just the natural rock that was there. I’d been excited about visiting the two remaining larger islands, Bryher and it’s neighbour Samson, as I’d read Michael Morpurgo’s Why the Whales Came a few years ago and adored the story and previously could only imagine what the location it was set in was like. 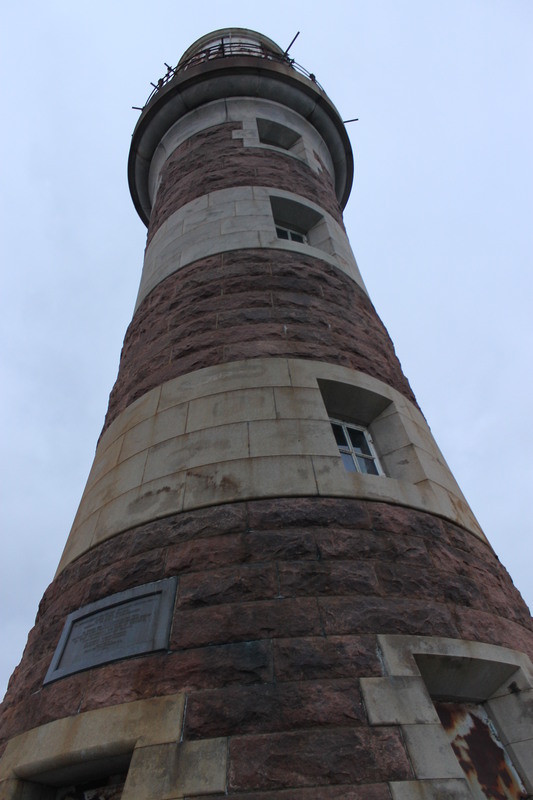 Although there was a lack of lighthouses on either island, they didn’t disappoint and I was glad to have a bit of an explore around the places mentioned in the book. Bryher is a wonderful island and, if I’m ever lucky enough to return to the Scillies I would love to spend more time there. Among the other islands we visited during our holiday were St Helen’s, Great Ganilly, Little Ganilly, Gweal, Tean and Great Arthur. Again, each one of these islands had their own personality and because the Isles of Scilly are relatively flat (compared to some of the islands we’ve visited) most were quite easy to access. Back in April I was given a particularly great opportunity to have a look inside our most “local” lighthouse, Strathy Point. Through a very kind work colleague of Bob’s, who lives in the lighthouse compound, we managed to have a really good nose around. The tower itself, which only came into service in 1958, marked a previously “dark” area on the north coast. The first proposal for a lighthouse to be positioned here was submitted, and rejected, back in 1900 and a temporary light was displayed at Strathy Point during the Second World War. Joan, my new friend at the lighthouse, lent us a short film which followed one of the Northern Lighthouse Board’s visits to various lighthouses around the north of Scotland in 1958 (the film can be viewed online here). The film shows the opening of Strathy Point lighthouse. After a review of local shipping and, apparently, local consultation, a decision was made by the General Lighthouse Authorities in 2010 that the light should be switched off. This happened in March 2012, a sad occasion for the residents of Strathy and the surrounding villages who had become so used to seeing the light sweeping across the nearby land. The lighthouse tower was then sold in 2013 to a very friendly man named John, who is currently renovating the internals of the building. We enjoyed our tour around. My favourite part had to be the lamp room, which John has a couple of stools in for making the most of the impressive panoramic views. I had a vision while up there of how I would have done it up with a lovely window seat around the sides and Joan and I agreed that the wide staircase on the way up to the lamp room would be the perfect place for some nice, curved bookcases! One of the glass panes up in the lamp room has sustained some damage fairly recently after the tower was struck by lightning. There was also damage done to the outside of the structure. While we were there, John took us down a ladder leading to a platform and showed us a hidden room that is only accessible from the tower. He told us about his plans for the room, which will turn it from a disused water tank store to another viewing area for gazing out to sea. My birthday present this year from Bob was a few days staying in the lighthouse cottage on Eilean Ban, a small island underneath the bridge across to Skye. We’d previously only spent a couple of days on Skye (together, anyway), so the cottage was a good base for exploring the island a bit more – and for seeing a bit more of the lighthouse on the island itself, of course. On my birthday we stopped off at the Eilean Ban Trust’s Bright Water Visitor Centre in Kyleakin. A lot of the information there centres on Gavin Maxwell, but there was also some details on the history of the lighthouse. There were some old pictures of the lighthouse before the Skye Bridge was built and it looked considerably bigger (at 70 foot tall) than it does now, being dwarfed by the bridge these days. The lighthouse was built in 1857 and was discontinued in 1993, but it continues to be used as a day mark, so fortunately it is important that its condition is maintained. Lesley told us that she would be running a tour that evening, which would involve going into the lighthouse, so we immediately signed up to join that. That afternoon we headed to Plockton. We’d noticed on the OS map that there was a lighthouse on Eilean a’ Chait, a small island north of Plockton, that we’d not been able to see from the mainland. Bob had done some research and thought that a trip with Calum’s Seal Trips might help us to see it. He wasn’t wrong as, when Calum heard that we were interested in the lighthouse, he managed to get us as close as he could to it. We arrived back in time to meet Lesley and she showed us around the island, including inside the Bothy where they have a lot of information about the lighthouse and our little man and I were able to get the first stamp in our lighthouse passports! Apparently it was the first time their stamp had been used! It was great to get to the top of the lighthouse and see the importance of the structure without it being overshadowed by the bridge. I’d definitely recommend a tour to anyone in the area. That evening we went for dinner at Seumas’ Bar at the Sligachan Hotel. The following day we decided to make the most of the (relatively) nice weather so we headed across to Raasay, an island off of the east coast of Skye. As soon as we arrived our first priority was to reach the lighthouse at Eyre Point at the south of the island. Although the lighthouse was nothing out of the ordinary (one of the modern “Ikea flat pack” style models, as we call them), there were some fantastic views towards the mountains on Skye. We then drove north to experience Calum’s Road. Calum’s Road, one and three quarter miles in length, was built by Calum MacLeod and his brother between 1949 and 1952 after unsuccessfully campaigning for years for a road to allow easier access to and from the north of the island. Calum was also a Local Assistant Keeper at Rona lighthouse. Calum was awarded the British Empire Medal for making sure supplies regularly reached Rona lighthouse – due to his building of the road. 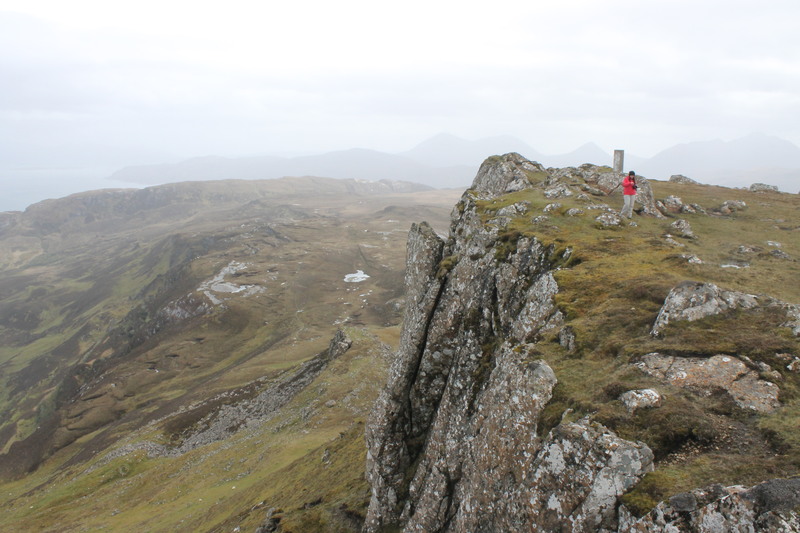 We then parked up next to the main road for a walk up to the highest point on Raasay, Dun Caan. It’s a really interesting hill that stands out alongside the others from Skye due to the flat appearance of its summit. There were some great views on the way up and a rather scary drop on one side of the summit where the land drops away just next to the trig point. We stopped off at Raasay House for tea and cake before catching the ferry back to Skye. We had a quick run over to see the Cuillins from Elgol before heading back to our accommodation. We returned to Elgol the following day where we managed to take the last three places on the Bella Jane, which sails out into Loch Coruisk towards the Cuillins. The weather wasn’t great and the tops of some of the hills were in the clouds, but there were still some pretty impressive sights. Such a beautiful place and some amazing views on the drive there too. We had a lovely lunch at Elgol Shop. After leaving Skye, we stopped at Eilean Donan Castle and had a look around. It was nice to finally go in as it is an iconic building and the subject of many people’s holiday pictures during a visit to Scotland. 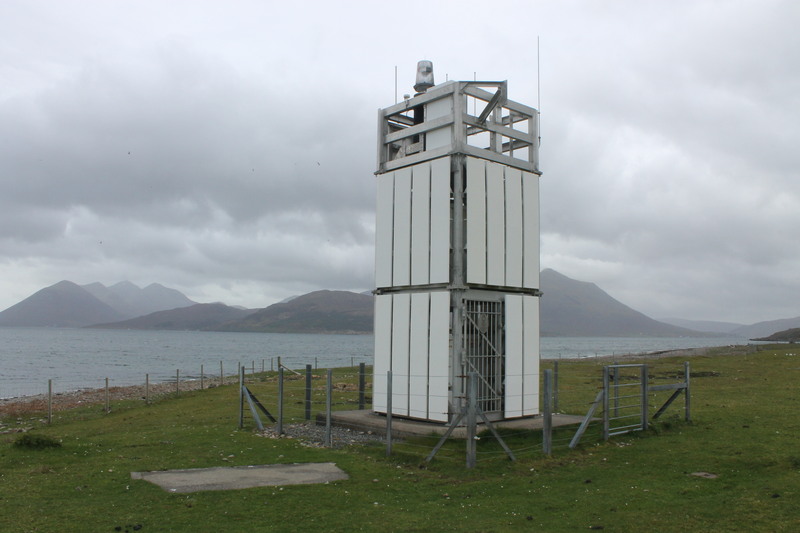 We had a great few days and look forward to some more visits to Skye in the future, particularly as there are still a couple of lighthouses to be visited there, including Waternish Point, which is fairly remote. I mentioned in my post last week that I was expecting to visit more lighthouses this weekend. I am pleased to confirm that this was most definitely the case with 10 lighthouses visited on Saturday and a further 2 on Sunday. We began our weekend in Berwick upon Tweed on the Scottish-English border. Apparently, although Berwick is now considered to be in England, it has changed hands between England and Scotland 13 times and, at one point, was its own independent borough (or burgh, depending on where you are), which was sworn enemies with Russia! It is also a place that the artist L S Lowry visited regularly and some of his paintings are of scenes in and around Berwick, including the pier on the end of which sits the lighthouse. Seeing the lighthouse from a distance (you can often see it from the East Coast train on the way to Edinburgh) it looks fairly small and insignificant, but it’s actually quite a substantial structure. We had a lovely stroll out along the pier, enjoying the surrounding area before officially bagging the lighthouse. On the way to our next lighthouse we took advantage of the tide being out and drove over to Lindisfarne (or Holy Island). Although there are no lighthouses on the island – just a beacon, which I walked to last year, and a couple of daymarks just across from the island – we were able to see the high point of the island, on which Lindisfarne Castle sits, which we need to go back to in the future. Our next stop was Bamburgh where rules were broken. Firstly we parked as close as we could to the lighthouse, completely obscuring the ‘No parking’ sign. Bob also chose to climb over the wall surrounding the lighthouse to bag it, without realising that the ground was slightly lower on the other side of the wall, but he managed to fly back over after touching the lighthouse anyway. Bamburgh lighthouse is a very unique building, I’ve never seen another like it so far. It’s essentially a white cube (with an extra bit) with a black ‘Lego man head’ on top. I say that because it looks pretty much the same shape as the head of a Lego figure (see picture on the right for proof). There are some stunning views from the lighthouse, including across to the Farne islands and to Bamburgh Castle. 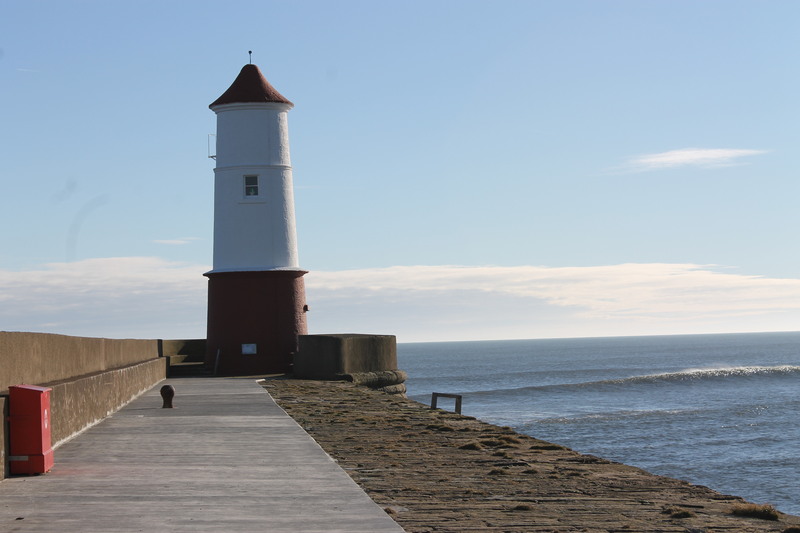 We moved on to Seahouses next and North Sunderland Pier Head lighthouse. 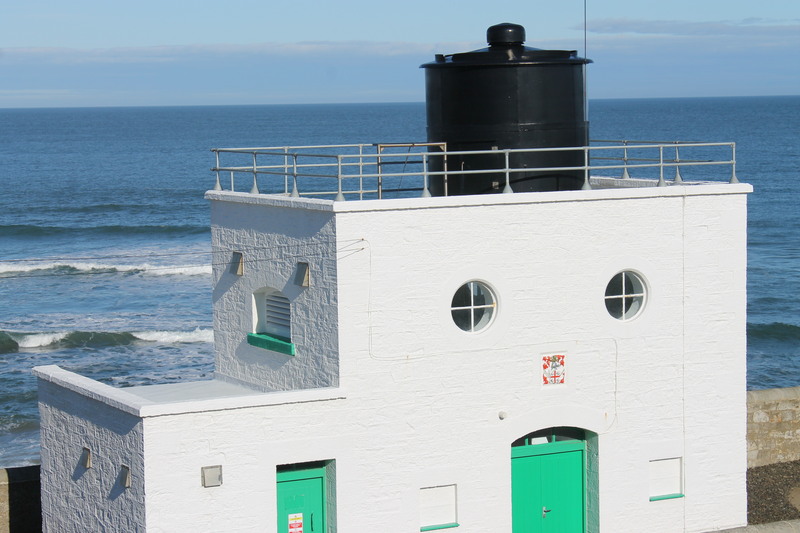 The lighthouse is an odd-looking structure, not a typical lighthouse at all, but we were incredibly pleased that we chose to stop there as a couple of companies offering boat trips out to the Farne Islands from the pier. Unfortunately they don’t start landing on the islands until Easter, but as we were limited by time that wasn’t a problem. 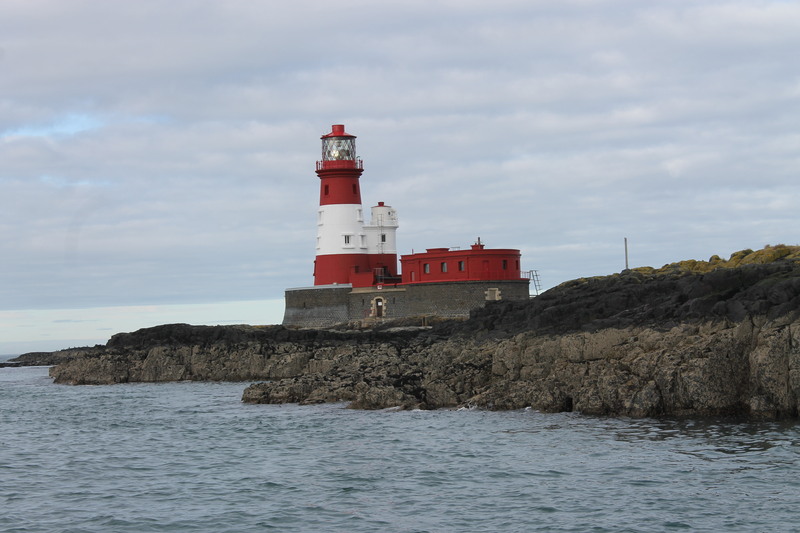 We took the 90-minute tour out around the islands, getting some really good views of both lighthouses, that on Inner Farne above some breathtaking cliffs and Longstone, a fantastic red and white building. Another highlight of the trip was seeing hundreds of seals lining the rocks across a couple of the islands. They were a little smelly (apparently this is the only time of year you are able to smell them), but there were so many colours and some adorable little ones. It was a great trip and I’m so pleased we were able to see some more island lighthouses – the extra effort you put into seeing them makes them a bit more special. Heading south again we passed through Warkworth and headed for Amble to see the Warkworth Harbour lighthouse. When I originally visited on my tour last year I was a little disappointed by it as it just looks like a red and white striped pole with a light on top. It doesn’t help that the end of the pier is not accessible so you don’t get a complete picture of its actual size. One of the interesting things about visiting lighthouses is that you do get a real variety. There are some that you see in some fairly unpleasant locations that you know you won’t want to visit again, while a few miles down the road there is an absolutely beautiful one. 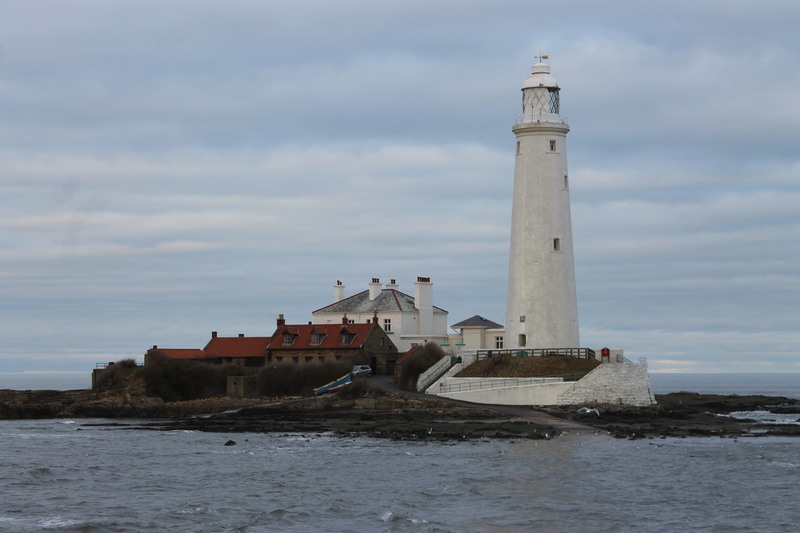 This was certainly the case after Warkworth as our next stop was St Mary’s lighthouse on a small tidal island a short distance off of the coast north of Whitley Bay. It makes for a beautiful scene and, although I’ve not yet been able to get across to the island as the tide has been in both times I’ve visited, it is still close enough to the mainland to get some brilliant pictures. As we were running short on time we bypassed the lighthouses in North and South Shields and headed straight on down the road to Souter lighthouse. At the time I first contacted Bob I was in the process of applying for a job that had come up at Souter. I didn’t get the job, which was probably fortunate in the long-run as my future plans have changed just a little bit now. It is still a great place though, although I’ve still yet to arrive there at a sensible time when The National Trust are running the tours. The final two lighthouses of the day, Seaburn and Roker Pier, were just a short distance apart. Seaburn lighthouse was originally built on the end of Sunderland’s south pier in 1856, but was dismantled when improvements were made to the harbour. Fortunately, they didn’t just throw it away, they re-erected it in its current location in Roker Cliff Park. The lighthouse on the end of Roker pier a short distance away is a really interesting structure with the stripes created by the use of different types of stone. It is a beautiful tower and we managed to catch it with the first glimpses of the red sunset highlighting the top of the lighthouse (not visible in the picture to the right, unfortunately). It’s a fairly long pier, particularly when you are in a bit of a hurry, and is prone to large waves crashing over it, but it was a calm day with no opportunity to get wet (unfortunately for Bob). Our main reason for being in this area was to attend the 10th anniversary masquerade ball of Fire and Ice Expeditions. It was a great night and a really good opporunity to meet more people who Bob has been on some of his adventures with. A very enjoyable evening. On Sunday we headed for Hartlepool, one of a handful of places I’ve been to in the UK that I don’t particularly want to re-visit. 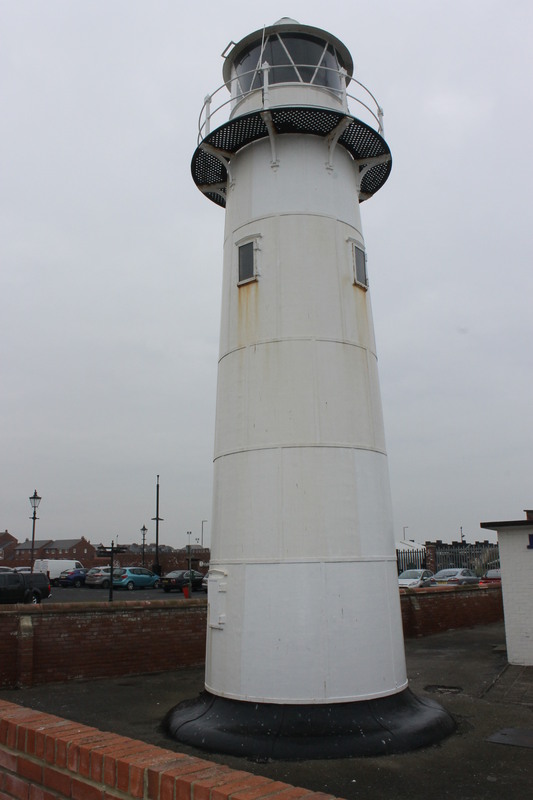 However, there were a couple of lighthouses I had missed on my tour so we managed to “tidy these up” (Bob’s wording) by first visiting The Heugh on The Headland north of Hartlepool. Then we went on a ridiculously long drive through Hartlepool and down to the south, near Redcar. It doesn’t look far on a map, but the roads aren’t fast-moving and it’s a very industrial area so there are really no views to enjoy – for me anyway. The final lighthouse of our weekend was at South Gare. This was a very quick stop as neither of us had a good feeling about the place so we moved on swiftly. The weekend just passed was yet another enjoyable one and this time in another new part of the country. After meeting in Carlisle at our usual “home away from home” (the Premier Inn), Bob and I headed south to Welshpool to meet Myrddyn Phillips, who is currently filming a series of interviews with Bob about his Seven Summits expeditions. After crossing the Welsh/English border a number of times, we arrived at Myrddyn’s and chatted over a cup of tea. We then headed out to Heath Mynd for filming of the interview about Mount Vinson in Antarctica and a pre-Everest (the Big Hill) video. Heath Mynd is an English “Marilyn” (a hill or mountain with a drop of at least 150m on each side) and, after the first interview, we proceeded to struggle through the thick heather to reach the top where we had some fantastic panoramic views over to a variety of English and Welsh hills. This marked my third Marilyn and was the first that actually involved a walk of more than 10 metres to the top! After we had found a more sensible route down and filmed the pre-Big Hill interview, we headed back and went for dinner. 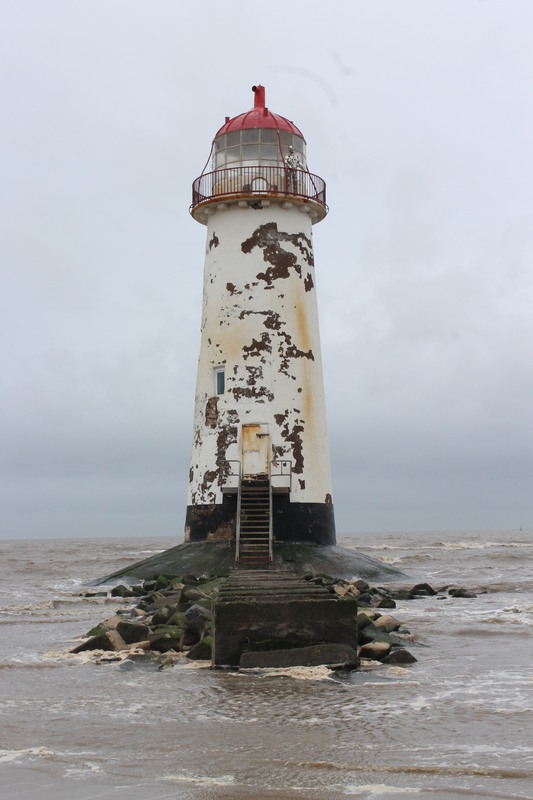 On Sunday, my main objective was to reach the Point of Ayr lighthouse at Talacre on the north coast of Wales. Having visited all of the lighthouses on mainland Wales now, this one stands out in my mind as a particular favourite. Although it’s not looking particularly special and – from some angles – you can see how it much it is tilting now, it has so much personality (as much as a lighthouse can anyway) and it’s very easily approached. I was keen for Bob to see this one too while we were in the area. On the drive from Oswestry (which, we were informed by the member of the staff at the hotel, was in England) we headed north and passed through the village of Pant for the second time. This had brought on a severe case of the giggles (from me) the previous day and did so again on Sunday. I have a feeling it was the amount of repetitions the word received in such a short space of time that made it so funny. Our first drive through the village was so enjoyable that passing the sign on the second drive through Bob announced in a surprised, yet delighted tone: ‘Pant!’ and the fun started all over again. We really should stop there in the future to see what, if anything, it has to offer. Heading up the road, we stopped briefly at the Pontcysyllte aqueduct near Llangollen for me to take some pictures and Bob to research a Marilyn we would be passing on our way to the lighthouse. 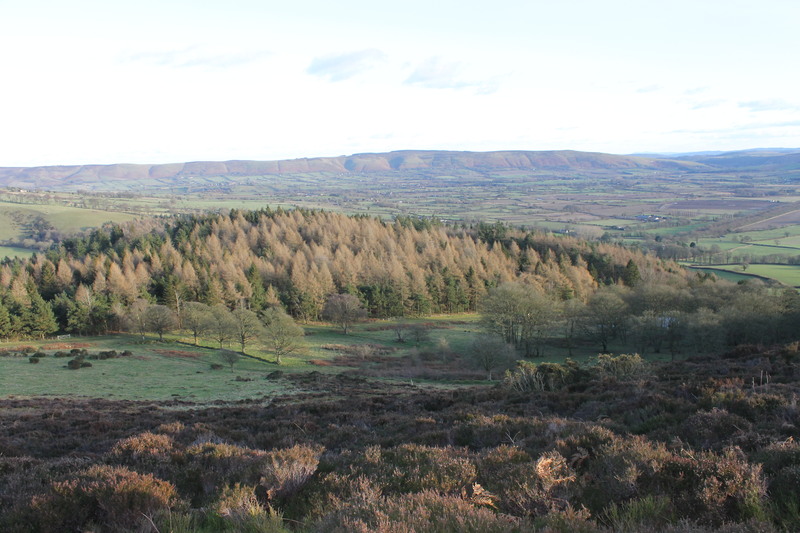 We then followed a winding road – which Bob enjoyed driving while I held on to my seat – to Horseshoe Pass where we parked and walked up Moel y Gamelin. We were surrounded by cloud on the way to the summit, which was fortunate really as the cloud cleared on the way back and we could look back at the distance we had walked, which looked a lot longer and more daunting than it actually was. After reaching the top of my fourth Marilyn, Bob marked the occasion by revealing a bag of Revels! There were some stunning views on the way down after the clouds had cleared. We continued the celebration with lunch at a nearby café. A short time later we reached Talacre and the lighthouse. For a change from my first visit, the tide was coming in as when we arrived. Bob was disappointed as it meant that we couldn’t touch the lighthouse. He considered walking across the line of rocks leading the lighthouse, but I suggested that it might not be a very good idea and he (only just) obeyed my orders not to attempt it. There’s something about a lighthouse on a beach that I love and I think it’s that the beach is such an enjoyable place to go, particularly when you are a child, and to throw a lighthouse into the mix is, for me, a very exciting prospect! Heading back towards England, I was concentrating on the road (as one should when driving) and Bob uttered his ‘Uh, Sarah’, which usually means he’s concerned or there’s something I’ve missed (he’d said it on Sunday morning too when my crumpet was on fire in the toaster). 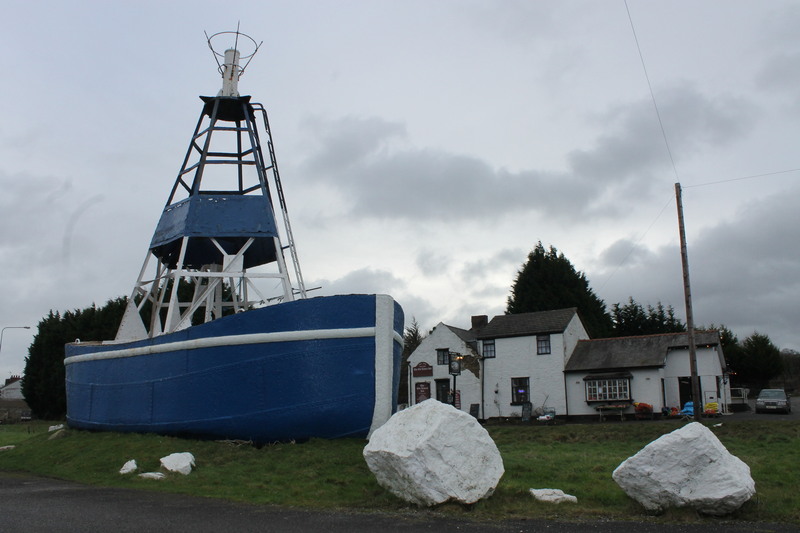 It turned out that I had driven past what appeared to be an old lightship sitting at the side of the road at Mostyn. After turning around (not doing a handbrake turn, as Bob suggested) we stopped off and had a look at this intriguing boat. I still have yet to find out anything about it as much of the information about Mostyn Harbour is focussed on the old Duke of Lancaster ship, which is rusting away nearby. I shall continue to research this though. For those of you who may have visited this blog recently, you might have noticed that there is a slight difference now in the title. Where previously it was uklighthousetour2012, you will notice that there is a distinct lack of 2012 about it now (although this still remains in the web address). There is one, probably very obvious, reason for this: that there is just one day left of 2012 and the lighthouse tour is simply not complete. As far as I can see the tour won’t be finished for quite some time. With 140 island-based lighthouses and a further 14 on rocks in the middle of the sea there is certainly a lot more ground to cover. I think it’s safe to say that 2012 has been rather good to me. However, I won’t let the year itself take all of the credit as I was the one to make the decision to travel the coast when I did, which has ultimately changed my life completely and will continue to do so next year. I would like to say a huge and massive thank you to everyone who has supported my lighthouse endeavours this year. There is a full list of you wonderful people here. I would like to highlight, in particular, my parents who saved the day when, just a few weeks before I was due to set off, Little Car’s service and MOT cost me a ridiculous amount and they assisted financially to ensure that I was able to go ahead with the trip. Thanks also to Weiner (Liz) for the emergency bank transfer to cover the last few days of the trip and also for keeping the map up-to-date as I moved around. Big thanks too to Gavin Williams at Premier FD for the sponsorship. My biggest thanks, following the conclusion of the month-long tour, should go to Bob for making sure that the end of the month did not mean the end of the tour. Since July I have been to so many news places and lighthouses as well as getting much closer to some of those lights I saw during my month-long trip. Also, I should thank Bob for being in the right place at the right time on 27 May, of course!